That was 11 years ago, when more than 100,000 people (mostly women and children) had fled their homes because of air raids and fierce gun battles in an all-out war in Mindanao, in the Philippines. Today, Bai Aniza and her neighbors are sowing the seeds of peace in their own village. 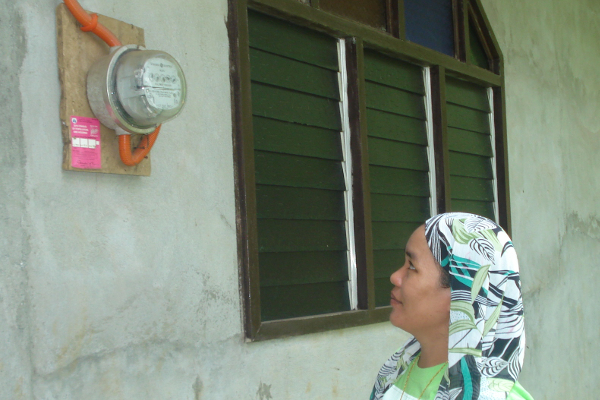 Winrock’s help — through the Alliance for Mindanao and Multi-Regional Renewable/Rural Energy Development (AMORE) program — could not have come at a better time for villagers struggling to rebuild. Finding a river source capable of generating 45kW of electricity, AMORE set out to build a micro hdyro power plant in Sapad. To ensure sustainability, AMORE helped organize the Barangay Sapad Renewable Energy and Community Development Association. Women held key positions in the association, which grew to become a small electric cooperative in the village. As more families returned to the village, more connections were served by the association, with some households running their own small business.